In our post on Monday, Deb voiced her questions for God. In some circles that's against the rules; some see it as lack of faith. But there are many examples in the Bible of people who questioned God: Job, David, Sarah, Jonah, and even Jesus. There's no way, if those people had questions, that questions signal a lack of faith. Questioning brings us to the end of ourselves; its a symptom of suffering, and may be a sign of healing. Just as itching can indicate that a wound is healing, questions to God may indicate a strengthening point in our journey through grief. Not that they make you feel strong and confident; far from that--you're not ready to run a marathon yet. Rather, we need to understand that questions are a sign of life. You're breathing, blood is circulating, enough oxygen is getting to the brain, you're thinking. That's a good thing. 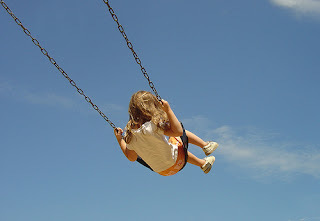 I saw myself as a four-year-old little girl swinging high in the sky with her best friend Bruce, on a happy summer day. Vintage two-story colonials lined the street of the neigborhood where treetops touched their fingertips overhead and daisies and rose bushes smiled in patches of sunshine. As I pumped my swing higher and higher, the wind streamed my blonde bangs off my forehead, and the sun warmed my tan arms and legs. Bruce and I looked at each other, our eyes full of love, faces smiling while we laughed and teased, trying to out fly one another. Then I heard a squeaky screen door open from the house next door, God's house. His big feet stomped off his freshly swept back porch and came towards Bruce and I as our swings sailed up and down together. With one large hand God lovingly scooped Bruce up to be with Him; but with the other He clenched a fist and punched me off the swing. I flew through the air and crashed on sharp stones; knees and hands scraped and bloody, inlaid with dirt and small stones, my lip cut and gritty. Crumpled on the ground, I heard myself sobbing—a brokenhearted little girl who had never known such pain before. I heard the sound of footsteps walking away from me. The door to God’s nice house slammed shut and the deadbolt clicked and locked me out. It's also the best place. Because inside that tomb, the pain cuts deep furrows where God, the master of resurrections and new life, will plant joy. Over the next several weeks I'd like to show you how joy gets planted. What? You want it Right Now? Yes, I know, but it takes time. For now give yourself time, like Myra said last Wednesday. Allow yourself the questions, like Deb voiced on Monday. Find yourself some good friends and a community to grieve in, which you'll hear about this coming Monday. Above all, pray and wait, even while you're crumpled on the ground, even while you don't have words. God hears your groans. If you're not crumpled on the ground, I'm glad. God's grace spares some and they don't feel like this at all. Grief is different for everyone. Bear with the fallen, though, the knocked down and abandoned. Watch and wait with us to see the good plans and path God has in store. Your writing takes my breath away. Thank you for your honesty and your vulnerability. Thank you for allowing God to take your pain and help others. I pray for your ministry and that many will read your words and know the hope that is in Christ. Wow Aunt Ferree that was moving! Thank you for sharing! Oh, wow....this describes it pretty perfectly. Thanks for sharing. Your comments mean so much to me, thank you everyone!